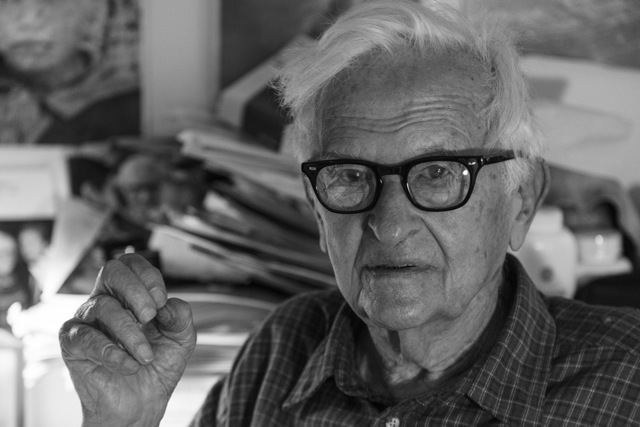 When Albert Maysles talks about the subjects of his documentaries he uses words like “rapport”, “empathy”, “respect”, he talks a lot about finding “common ground”. 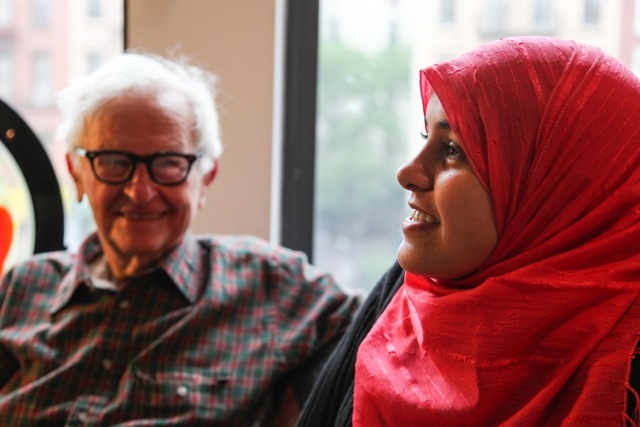 When they met for the first time in the cozy, cluttered offices of the Maysles Film Institute, in Harlem, it took all of a few minutes for 86-year-old Albert, son of Jewish immigrant parents from Eastern Europe, to find common ground with Faiza Almontaser, a 17-year-old Muslim daughter of parents who emigrated from Yemen to Brooklyn in 2006. 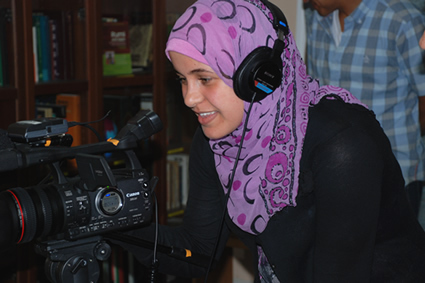 Faiza, lovely and composed with the quiet fierceness of someone with much to say and a desire to be understood, recited for all of us a rap poem that she had written — one that had earned her celebrity status in her public high school. The poem describes her experiences with the bullying, bias, and stereotyping that she encountered when she first arrived in the U.S. — a young girl in a headscarf and long skirt (and Converse!) riding the subway and walking the hallways of her middle school not yet able to speak English — in post 9/11 New York City. Albert listened, rapt in the characteristic manner of someone whose motto about people and life is all about “love, understanding, and giving special care to outsiders to make a better life”. We were all moved by Faiza’s powerful expression of the hate, intolerance and ignorance she faced and also by the beautiful spirit of shared humanity her poem urged us to focus on. Albert complimented Faiza on her eloquent words and her passionate delivery and then told her a story of his own run in with bullies — Irish boys in his Boston neighborhood who regularly beat him up (a skinny Jewish kid with glasses) on his way home from school. Faiza gave Albert the same knowing attention he had shown her and they got up from the couch, firmly on common ground, hugged each other and a great film partnership was born! Evening fell on Lenox Avenue, street lights and the neon glow of the Lenox Lounge illuminated the film stills of the Maysles brothers’ landmark films — Salesman, Gimme Shelter, Grey Gardens — and our mentor and his eager pupil kept talking. Topics ranged freely from camera technique (“Hold it steady!”) to the psychology of a bully, to telling real world stories on film, to the many attributes of the delicious cookies Holly had brought to our meeting. 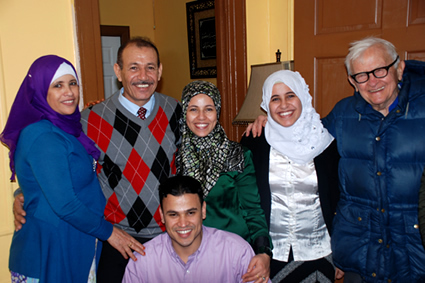 A few hours had passed and as we headed to the 125th Street subway station we knew an amazing bond was formed and Faiza’s story would be heard and change hearts and minds. Get a peek behind the scenes of the making of POET WITHOUT PREJUDICE. 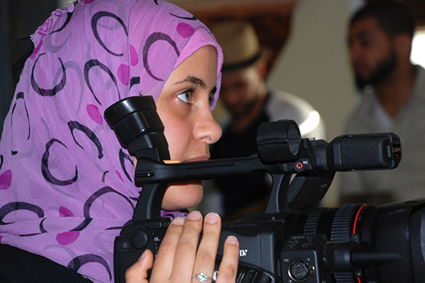 Under the mentorship of the award-winning, late filmmaker Albert Maysles, Faiza will offer a strong voice to the quieted strife of immigrant children.